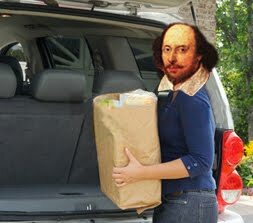 Here at Everyday Shakespeare we take a slightly unorthodox approach to book reviews. We're interested in books that give us moments of pure escapism. Dialogue, plots, quips, or characters that make us feel the poetry of Everyday, as opposed to its drudgery. WILL POWER is written by A.J. Hartley, a Shakespeare professor with a keen interest in goblin/human combat. 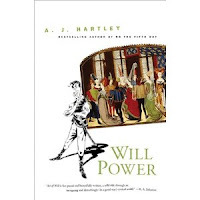 Despite its title, WILL POWER is not about using Shakespeare as a confidence-building tool or as an appetite suppressant. Rather, the eponymous "Will," a man names Will Hawthorne, is a former thespian and all-around goofball who rolls with some truly freaky people. In the fantasy world of WILL POWER, our hero faces perils such as a goblin infestation and a bitchy lady named Renthrette. Highjinx ensues underground, in a forest, and in the strangest library you've ever encountered. Glad you liked the book, guys! Maybe we'll cross paths one day at SAA.